IN STOCK & READY TO SHIP! Looking for a deal? Ask about factory refurbished machines. 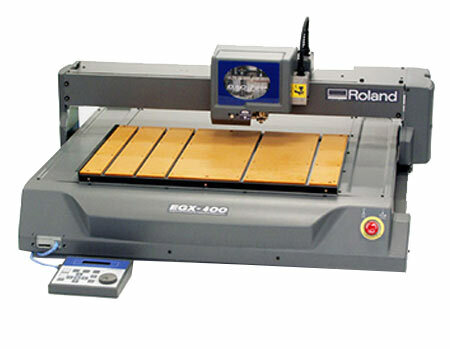 Roland EGX PRO engravers have the power, size and speed professional engravers need. In addition to personalizing awards, corporate crests and promotional items, these bench-top devices turn out quality indoor and ADA signage. Your signs will have an upscale look while meeting all ADA regulations. Both have the EGX-400 & EGX- 600 have a Z axis height of 1.57”. The hand-held control panel can be extended from the machine, allowing you to start or pause a job from a safe distance. It has a jog dial for changing spindle speed and selecting options on the menu. The EGX-400 and EGX-600 employ a gantry X-axis rail and flat table system that provides space for placing long boards for larger signs. An optional center vise quickly secures engraving materials.